Our skilled craftsman replaced the missing pieces on this valuable frame with new wood. 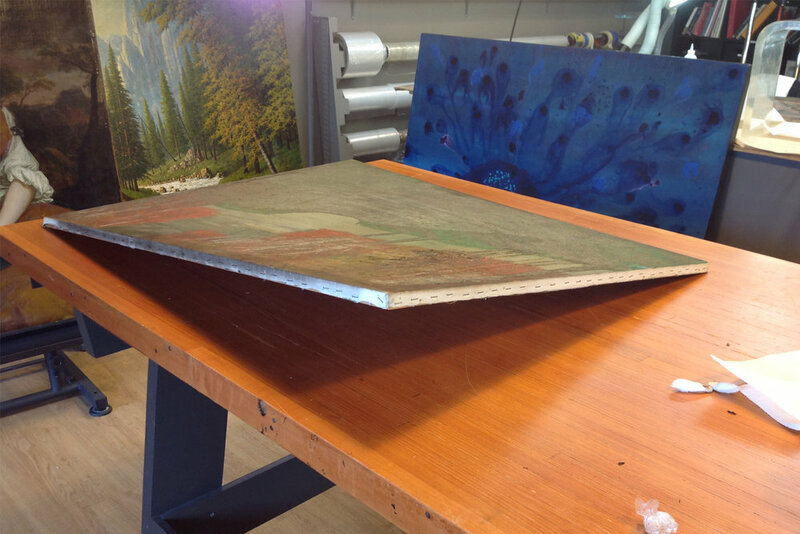 Paintings commonly get warped and racked. We can repair the stretcher bars or replace them so your painting lays flat on the wall. Frames can really take a beating. We recast missing frame parts in resin, which is then sanded and formed to perfection. They can then be painted to match. gold leafed, or oil gilded. Due to the thin and fragile nature of gold leaf carful toning of the substructure is needed to create seamless reconstruction. Frames get wonky over time. Before repairing the aesthetic, we square them and strengthen them. A slack canvas can be very damaging to a painting. We make sure the canvas is tight before we work on the front. Unsightly losses can be perfectly reconstructed and matched to the original. Sometimes a beautiful painting just needs the correct frame. We can help you choose one, install it, add new hardware and paper to the back so it is ready to hang. Antique frames hold valuable clues about the history and legacy of the art they carry. We repair damaged or broken frame elements back together to restore the intention of the maker and reduce distracting damage. Our services also include gilding and we are fully trained in both traditional water and oil gilding. All of these art frame treatments and processes are carried out in compliance with the American Institute for Conservation’s (AIC) Code of Ethics.